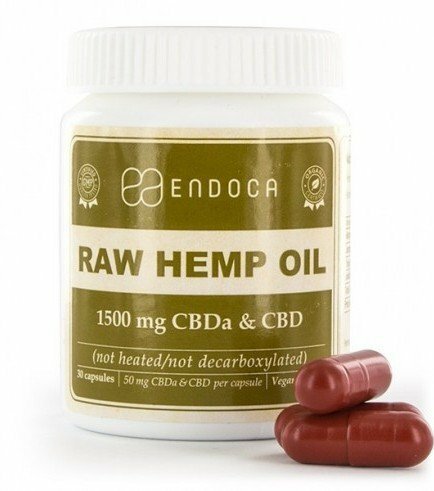 Endoca Raw Hemp Oil Capsules (15% CBD + CBDA) are made with the finest organic hemp oil, using plants grown in the EU without the use of pesticides or herbicides in order to achieve a safe and high-quality product. Each capsule contains 50mg CBD+CBDA Contents: 30 capsules Each capsule contains 50mg CBD+CBDa encapsulated in gluten-free, Kosher vegan gel caps which are tasteless easy to ingest. Endoca produces their CBD products from hemp plants that are grown in the EU without the use of any chemicals. The production of Endoca’s Raw Hemp Oil is done under low temperatures and high pressure, a cold-press juicing process if you will, that leads to a concentrated food supplement. Endoca's Raw Hemp Oil has distinctive qualities because it contains not only CBD, but also CBDA or Cannabidiolic Acid, which is cannabidiol in a carboxylic acid form. The gel caps used to contain the oil are both gluten-free, vegan and kosher. Capsules provide a dose which is consistent, odorless and tasteless – convenient for those who do not like the taste of CBD oil. These capsules are also very easy to ingest due to their smooth and slick texture. Keep capsules refrigerated and dry at all times. One capsule per dosage, twice a day. Refrain from use if pregnant or breastfeeding. Myrcene, Limonene, Alpha & Beta -pinene, Linalool, B-caryophyllene, Caryophyllene oxide, Terpinolene and Humulene. Chlorophyll, Alkanes, Nitrogenous compounds, Amino acids, Sugars, Aldehydes, Alcohols, Ketones, Flavanoids, Glycosides, Vitamins, Pigments, Water and hemp seed oil. Also, low concentrations of CBC, CBG, CBN.